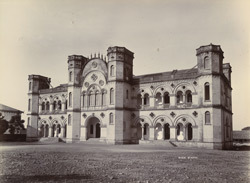 Photograph of the Bahadurkhanji High School at Junagadh, Gujarat, taken by the travelling commercial photographer F. Nelson in the 1890s from the Lee-Warner Collection: 'Photographs of Junagadh'. In 1853 the Nawab of Junagadh, Mahabat Khan II (r.1851-1882) agreed to subscribe funds for Western-style education within the state in conjunction with the Bombay Board of Education. The High School was started in Junagadh in 1873 under the Nawab’s patronage and was the State’s sole high school at the time. It was built by the Department of Public Works in a hybrid architectural style combining European Gothic and Islamic forms which was used for other civic buildings in Junagadh. This view shows the arcaded façade with towers at each corner and at either side of the entrance with a curved bangaldar-style roof in between.